Luckily for me, as I live in New England, the third Association for Critical Heritage Studies (ACHS) conference is a relatively close drive to Montreal, Canada. I’ve had the privilege of attending the first full day of the conference and wanted to summarize my experience for the benefit of those who could not attend or are curious about the ACHS. According to the conference organizers, there are 800 attendees from 51 countries, which is quite remarkable considering the recent genesis of ACHS. As I understand, the first conference in Sweden attracted 500 attendees, while the second conference in Australia attracted 300 attendees. 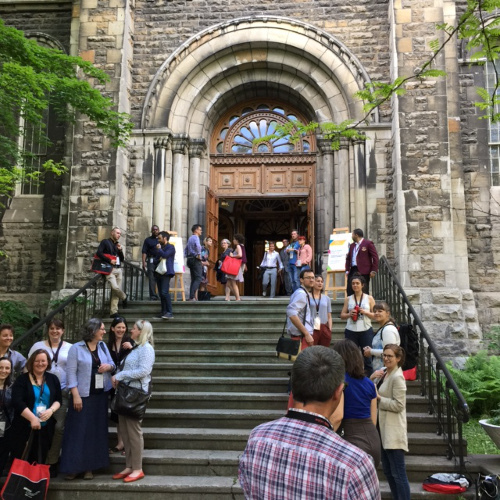 I would imagine that the much higher number of attendees in Montreal is due to the proximity of the venue to people who wanted to attend, but I would also attribute it to the growing interest in the field of critical heritage studies. Fragmentation: Heritage is often about differences and not commonalities, and these differences are everywhere and widespread. Heritage is defined by its fragmentation and contestation. Power: “Heritage is power.” Heritage practice is defined by “some people pretending to know more than others”, which is an allusion to the Authorized Heritage Discourse (AHD) and the control that experts have over the meanings of heritage. Solutions to address these issues: Consider heritage as an agent of change; free heritage rather than control its meanings; recognize that understanding heritage requires that we “overcome the demon of truth”; Authenticity needs to be redefined in a way that challenges power. The actors in heritage consist of elected officials, civil servants, laypeople, investors/developers (economic catalysts), and heritage experts. Of all of these actors, most criticism focuses on heritage experts. Volunteers who are involved in heritage civic organizations tend to be older, and outsiders (did not grow up in the community). In these organizations, volunteers who are heritage experts have the most power, even though the majority of volunteers are not in this category. Heritage is inherently political and is therefore controlled by the state. Herzfeld also advocated for a more critical position on being critical: “We must be willing to criticize not just critique” and in doing so, we need to make our efforts more concrete and less vague. The diversity of people at the conference is impressive, with many perspectives present, although, as is usual with most academic conferences, the continent of Africa is under-represented. Curiously absent, however, especially because of the proximity of Montreal to the United States, are professors who teach in programs with historic preservation majors, although Americans from other academic programs are certainly present. There are only a handful of educators from these kinds of programs at this conference, which is quite telling about the relationship between historic preservation education and critical heritage studies: there’s not much interaction. My personal observation is that this may be due to a combination of a lack of awareness of the ACHS and/or critical heritage studies as a field of study, or a just a lack of interest in the human-centered aspects of heritage conservation. While I find this observation troubling, I think it speaks to the larger issue of the need to build a bridge between historic preservation/built heritage conservation and critical heritage studies.